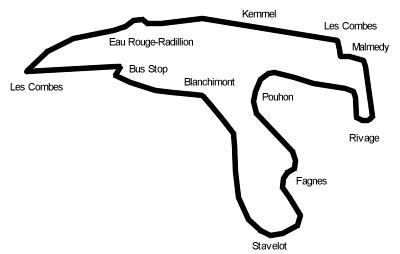 As you approach the first turn you will be travelling very quickly on the left hand side of the circuit. The corner is blind,over the slight crest that is adjacent to the pitlane exit. 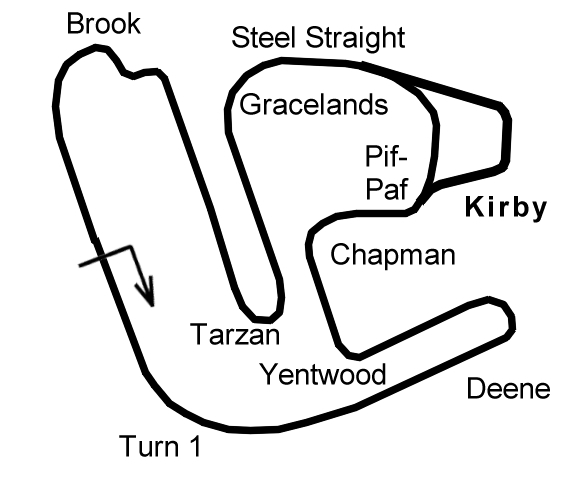 Over the brow of this slight crest the road kinks to the right so as you brake for the corner arc slightly to the right as if you are aiming for the centre of the track, thi s will bring you alongside the left hand kerb as you get to the turn in for the corner. Be very gentle on the brake in the last part of the braking zone and into the corner as the front of the car is very heavily loaded with the extreme braking and the down hill approach, it is easy to overload the front tyres here by asking for too much braking and turning at the same time which will cause you to run wide. Turn in late, approximately 2 car lengths before the kerb on the left ends. The apex has a sharp downhill drop on it and in a stiffly sprung single seater or GT car you should run a little wide, a front wheel drive car is more stable through here as you try to get the power down but it can still be a benefit to miss the apex a bit (a cars width wide is fine) to avoid picking up too much wheelspin. On the exit let the car run out wide, minimising the angle of the exit as much as you can. Use some of the tarmac run-off/extra track on the left at the exit along with the full width of the kerb and a little of the grasscrete beyond. The Mercedes Arena consists of 3 corners, the first two to the left and the third to the right, I’ll refer to them as 1, 2 and 3. 1: After exiting the Castrol S on the left of the circuit aim almost straight ahead as the roadstarts to turn left. As you get approx a third of the way out from the left hand side squeeze the brake and bring the car back into the left hand kerb. This corner has a long apex where you will hold the kerb for a while before moving out to the exit. From about half way along the inside kerb start to let the car drift out to the right but try to stay off the kerbs on the right on the exit. 2: Follow the kerbs on the right as you approach the downlill entry to the left hander. Brake hard initially but then immediately start to roll out of the brake as you balance the steering and brake as you start to bring the car into the apex. This is another long apex and the corner tightens half way round, this is where you want to pick up the apex on the left kerb and hold it until the kerb ends. 3: Turn into the right hander at the end of the apex kerb for corner 2. This is the most important corner in this section as a good exit here will determine your speed down the long straight to RTL and Ford Kurve. The key is to maximise the track width on entry, apex and exit to minimise the angle allowing you to carry as much speed as possible through the corner . Use all of the apex kerb and some grasscrete beyond if necessary and on the exit use the tarmac runoff, grass matting, kerb, basically any real-estate you can get your car onto to minimise the exit angle. The turn in point for the left handed part of these corners is approximately 1 metre before the grass stops and a strip of old tarmac (for an old access road) starts at the edge of the road. Come into the apex but stay off the kerb. Use the positive banking in the corner to allow you to get on the throttle and carry speed through the bend. Use the full width of the track on the exit. Bring the car back to the middle of the track then brake for the right hander. This has a downhill entry but a positive bank again so you can use this to help get the car turned in (the wider you go the less banking there is so the less help it gives). Get the car into the right hand side and hold the apex for a couple of metres without using the apex kerb. Accelerate out using the full track width including the kerb and the concrete strip beyond. 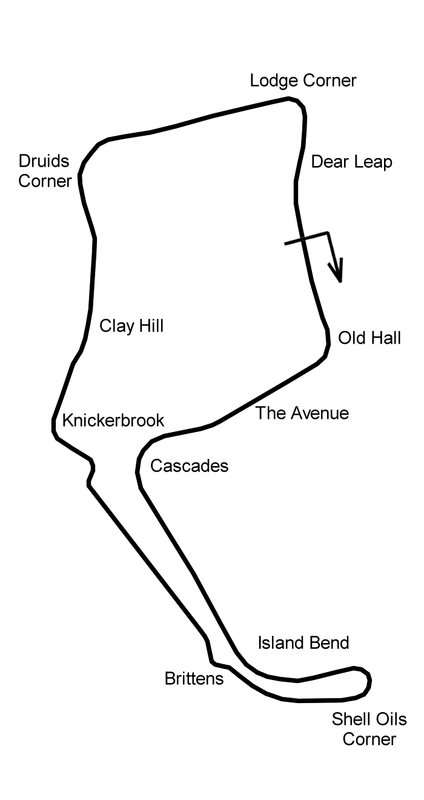 As you approach the corner bring the car out to the middle of the road to allow yourself a straight-line brake into the left of the track before you turn in as the track gently arcs to the left as it drops down the hill to the corner. Turn in late and on the brakes but be careful of overloading the front tyres as you are also traveling down a hill. Bring the car into the inside quite early (but stay off the high kerb) and hold the apex until about two thirds of the way around the corner. This bend promotes understeer so it is important to make sure you have the nose working well for you and pointed around the corner before you get on the power. The exit kerb and the concrete beyond can be used unless you have a very low car as the kerb is quite high. If you have a VERY well damped car you can use the high flat kerb on the right as you turn in to give you a little bit more of an open angle, otherwise stay off this and also stay off the apex kerb on the first left hander. This is the slowest of these two corners and you should do all you can to maximise your speed through here as this determines your speed back up the straight to Kumho Kurve. You can use the gradient of this uphill corner to allow you to carry a bit more speed in than you first think. The exit point for the left is the apex of the right hander, use all the kerb and the grass matting beyond it to straightline this bend as much as you can and use the full track width on the exit. You approach this corner uphill and the circuit plateaus at the corner so the braking can initially be a bit difficult to judge. Brake in a straight line on the extreme right of the circuit and turn in just before the end of the grass matting on the right. Try to use the camber of the corner to carry as much speed as you can into the bend. Clip the apex halfway around the corner (staying off the kerb) and run out to the full width of the track on the right (and a little bit of kerb) on the exit. Immediately point the car back over to the left ready for the Bit Kurve. Turn in from the very edge of the circuit on the left using a little bit of brake to help rotate the car and get the nose pointed into the corner. The first part of the turn starts to drop down hill so the car will feel like it is floating down to the apex. Just after the apex the road climbs again gently, giving you more grip and letting you get hard on the power. Just before the exit the road starts to drop again so you will run a little wider on the exit but use all the kerb and concrete strip beyond to straighten this exit trajectory. The corner feels like a gentler version of the Bombhole at Snetterton. A flat out kink. Stay off the kerbs all the way through and take the shallowest trajectory. There are 2 differant chicanes at Veedol, the on the Formula 1 cars use is the slowest and tightest where you will need to clatter over the kerbs to straighline it as much as you can for the fastest line. The first part, the left is the tightest and here you need to use as much kerb as your suspension can take, accelerate through the right using the lower, flatter part of the kerb and run out to the kerb on the left on the exit. The second version of the chicane gets used more for club racing and for the VLN races, it is much quicker and more open and a much more satisfying corner to drive. The first apex is blind as you approach, being over a small crest, so spot your braking but note that the chicane is fast so you won’t want to loose too much speed. Turn in just before the crest in the road (and hence, just before you can see the apex) and be careful of the bumps in the end of the braking zone and upto the apex. Use all of the apex kerb and the grass matting beyond and get back on the power at this point. Again use all of the kerb on the right and let the car slingshot out to the edge of the road on the left on the exit. 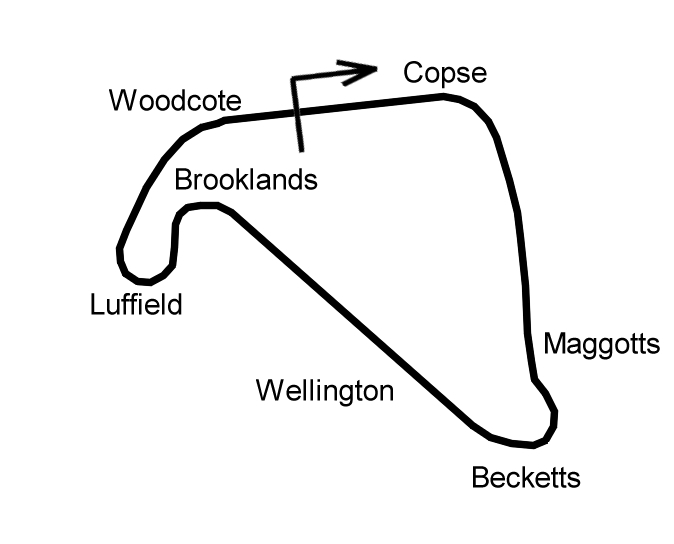 A fairly straightforward hairpin, be wary of making sure you get a good exit as this determines your speed down the long start/finish straight. 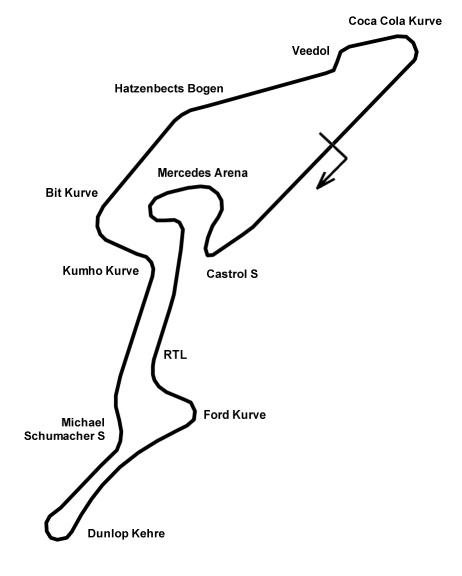 Turn in 2 car lengths before the split where the GP circuit turns right and the Nordschleife turns left. Carry the brake a good quarter of the way into the turn making sure you use the extra weight on the front to help turn the car and get the front pointed into the apex. The apex is a cars length after the start of the pitwall. Get on the throttle and let the car use all of the track width, the kerb and the concrete strip on the exit. There are a few obvious spots for overtaking, such as outbraking into the Castrol S, RTL, Dunlop Kehre, Kumho Kurve and the Veedol, but there are a couple of other corners whre you can surprise your competitor. The second left hander in the Mercedes Arena is one such place, it can be possible to dive up the inside here as the best line in is a wide approach. This will mean you will need to hold your competitor up on the apex otherwise they will repass you as you exit the following right having taken a cleaner line. You can also ovetake into Ford Kurve as alot of people will try to take the corner with a wider turn-in, so will sacrifice their speed through the preceeding left to position themselves for the right.